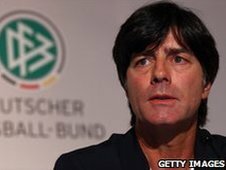 Germany coach Joachim Loew has signed a two-year contract extension which will keep him in the role until after the 2014 World Cup finals in Brazil. Loew's previous deal was due to expire after the European Championships in Poland and Ukraine in 2012. However, he was keen for his longer-term future to be resolved, saying that his situation had preyed on his mind in the run-up to the 2010 World Cup. Loew's backroom staff have also been given new two-year deals. Assistant Hansi Flick, goalkeeping coach Andreas Kopke and team manager Oliver Bierhoff will continue to work alongside the 51-year-old, who said it is a "wonderful job." "We believe that it makes sense to continue along this successful path with the national team," Loew stated. "We believe in the quality of our players and see good prospects for our team." Loew took over the German national side in 2006, leading them to the final of Euro 2008 and the World Cup semi-finals in 2010, losing to Spain in both games. He was recently linked with a summer move to Bayern Munich, but ruled out the possibility of combining that role with his national-team duties. "[It] would conflict with the interests of the league," he commented.